Many people are challenged in choosing the perfect gift for their moms, wives and girlfriends. Luckily, an Eternity Rose is the ultimate solution that is both enduring and elegant. 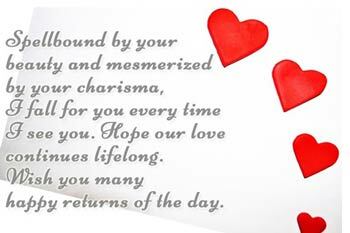 On her birthday, you should always aim for giving her a present that will forever remain in her mind….and in her heart. An Eternity Rose will always remind her of the love and thought you invested into the occasion. It is rare to come across a woman who does not love jewelry and flowers. Luckily, an Eternity Rose takes care of these two traditional styles of gift-giving into one single present, and in an exquisitely unique and life-lasting manner. In addition to an Eternity Rose, accompany this gift with a handwritten list of all the reasons you adore her. Irrespective of how bad your handwriting may be, this list will fill her not only with happiness, but also appreciation for your love. As children, we always looked forward to each birthday because of the presents and parties that lay ahead. When we reach adulthood, our priorities seem to change. At this age, what many people want most for their birthday is to celebrate the day with the people they love and to experience a deeper meaning of connection with loved ones in the occasion. If you are looking for the ideal time to show your love for someone who you really care about, then look no further than her birthday. A phone call or special birthday card is always welcome on a birthday, but you must check out The Eternity Rose website for a range of gorgeous gifts that will make her day even more lovely and enjoyable. We love to celebrate birthdays, but do you know exactly how this practice began? When ancient people established ways of telling time accurately, they began observing important occasions like birthdays. Prior to Christianity, civilization believed that birthdays represented an evil occasion, drawing the attention of bad spirits which would descend upon the celebrator. So for the purpose of keeping the spirits at bay, merriment was incorporated into the celebrations. Although birthday presents were uncommon in ancient times, people still flooded the celebrator with well wishes and encouraging messages. Some guests also brought along tokens which came to represent birthday gifts, and which were viewed to bestow good will and positivity on the person. Luckily, the notion of needing to give gifts to steer evil spirits away is long gone. Today, we give a birthday present to show the person that we respect and love them, and that we embrace them as they enter into a new annual chapter of their lives. Many will tell you that choosing a birthday gift is one of the hardest tasks they have to undertake. However, by understanding how this rich tradition started, we appreciate the value and worth of finding the perfect gift. At The Eternity Rose, we hope we have inspired you to maintain your focus and motivation to aim for purchasing the most perfect gift you could possibly give her. Our range of products make it easy for you to achieve this focus, as we know that she will love and enjoy the gift that you have taken your time to purchase from us. Spoil her and make her feel special with an Eternity Rose. And if you have only just discovered us after her birthday has already passed, keep us in mind for another important gift occasion such as Christmas or even Mother’s Day.